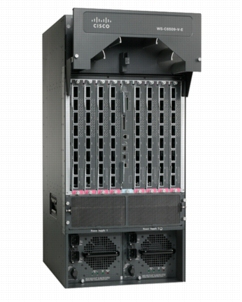 Cisco® introduces the Cisco Catalyst® 6509 Enhanced Vertical Chassis as part of the Cisco Catalyst 6500 Series enhanced (E-Series) switches, delivering chassis with up to 1440 Gbps of system bandwidth capacity (80 Gbps/slot), enhanced cable management, and front-to-back airflow optimized for hot aisle/cold aisle designs in data center and service provider colocation (NEBS-L3 compliant) deployments. Cisco Catalyst 6500 E-Series chassis provide superior investment protection by supporting multiple generations of products on the same chassis, lowering the total cost of ownership. The Cisco Catalyst 6509-V-E chassis (Figure 1) supports both the Cisco Catalyst 6500 Supervisor Engine 32 and the Cisco Catalyst 6500 Series Supervisor Engine 720 family of supervisor engines and associated LAN, WAN, and services modules. - 1440 Gbps system bandwidth capacity: The Cisco Catalyst 6509-V-E chassis is capable of providing up to 1440 Gbps of system bandwidth capacity at 80 Gbps/slot. This provides investment protection and the ability to grow to future high-bandwidth requirements in the network. - Front-to-back airflow: The Cisco Catalyst 6509-V-E chassis is designed to allow for hot aisle/cold aisle design in modern data centers with its front-to-back airflow design. - Enhanced cable management kit: The Cisco Catalyst 6509-V-E chassis comes default with an enhanced cable management kit that allows management of Category 5e, Category 6, Category 6a, and fiber cabling in a high-density configuration. - Redundant fan tray: The Cisco Catalyst 6509-V-E offers redundant fan trays to increase the availability of the system. Each fan tray has redundant fans, and the addition of a redundant fan tray helps ensure that the system becomes extremely reliable to fan/fan tray failure. - Standby fabric hot sync: The Cisco Catalyst 6509-V-E chassis supports the standby fabric hot sync feature, which enables as low as 50 ms failover from active to standby supervisor engine, increasing the availability of the system. - Redundant control channel: The Cisco Catalyst 6509-V-E chassis supports redundant Ethernet out of Band Channel (EoBC) for increased resiliency of backplane control traffic. - High system power capacity: The Cisco Catalyst 6509-V-E provides system power capacity up to 14500W, providing the ability to support fully loaded configurations of current and future high-density 10 Gigabit Ethernet cards. - AC and DC power options: The Cisco Catalyst 6509-V-E chassis supports both AC and DC power supply options. For AC power, 3000W, 4000W, 6000W, and 8700W power supplies are available. For DC power, 2500W and 4000W power supplies are available.